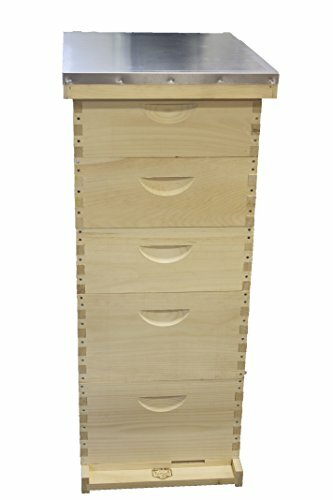 Hive includes the following: 1 Assembled Telescoping Top with heavy gauge aluminum 1 inch down the side and high grade 3/8 plywood; 1 Assembled Inner Cover with 1-1/2 inch heavy duty frame and 3/8 inch high grade plywood with 3/4 inch vent plus oval hole; 3 Commercial Unassembled Medium Finger Joint Boxes with pre-drilled fingers, 2 Commercial Unassembled Deep Finger Joint Boxes with pre-drilled fingers, 1 IPM Assembled Screened Bottom Board with slide out tray with counting grid, and 1 Entrance Reducer. The Main picture shown is select assembled woodenware for display purposes only. The commercial boxes you are buying are unassembled and no frames or foundation are included. Nails or staples and glue to assemble boxes are not included. Inspect all items and assemble boxes upon receipt. Items and components are made to order. We offer the Hive with frames and foundation. Returns are accepted within 14 days of receipt in new, unaltered, undamaged condition in original box/packing. Any issues or defects must be reported within 7 days of receipt. Buyer pays return shipping with tracking #, insurance, and delivery signature. Ships via FedEx Ground within the lower 48 U.S. states. No shipping to PO Boxes. Please indicate if residential or business address. Valley Bee Supply, 46 Tinkling Spring Rd., Fishersville, VA 22939. If there are any issues, please advise so we can make it right for you! We want you to be satisfied with our products! Thanks for shopping with us!! If you have any questions about this product by Valley Bee Supply, contact us by completing and submitting the form below. If you are looking for a specif part number, please include it with your message.